The photo is spreading on Facebook like a wildfire on a drought-infested African savanna. It shows a somber image of Vladimir Putin - President of the Russian Federation - on the cover of Time magazine. Photo-shopped into the image is a quote that says, "I admire President Duterte. Drug lords and notorious criminals are not humans, therefore they are not entitled to human rights." Although it wouldn't be surprising to hear such an utterance from the Russian leader, he never said it. A quick Google search for the quote shows it belongs to someone named Jose Alejandrino. 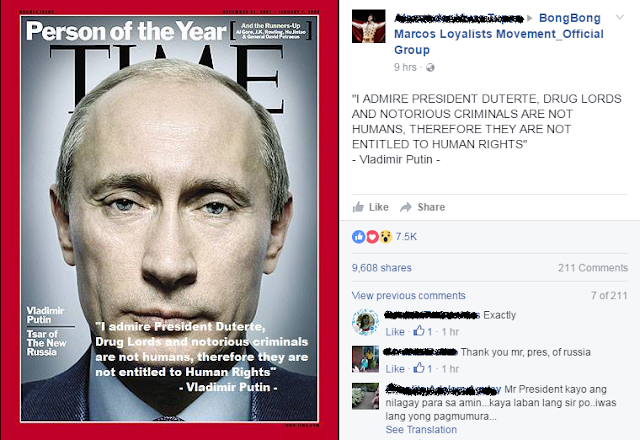 Apparently, one skewed Duterte warrior decided to copy the man's commentary then claim that it came from the mouth of the Russian leader. As to the Time magazine cover, it's from way back in 2007. What's baffling is that thousands of Filipinos believed the statement. 1. "Cguro konti lang ang nakaka alam na c pres. F.E.Marcos ang unang nag bukas ng relasyon natin sa Russia." 2. "I go with that! Actually, if one chooses to be a criminal, he should be automatically stripped off of his civil and human rights. What a wonderful world it would be." 3. "Mas excited c ttay digong n mkilala at mkausap c president putin kesa obama dhil iisa ang knilang pananaw ukol s paglaban s kriminalidad. Glit c obama kay putin dhil d cya agree s gusto ni obama." 4. "nong say niyo TAE ROSALES,CHR,Lai lai na de Lima pa ang lalaki mo, Risa HontiVIRUS sa sinabi ni Putin?" 5. "True leader and great men are like birds of the same feathers flocks together the same leadership advocacy and principles."